Why should I use MPMM? How will I benefit from using MPMM? Why is MPMM best practice? Invented by Method123 and perfected over 10 years, MPMM is a Project Management Methodology which describes in detail the phases, activities and tasks required to undertake a project from end-to-end. Every task within the Project Life Cycle is described in depth, providing you with all of the knowledge and tools required to deliver projects successfully. MPMM is currently used by more than 45,000 people around the world to undertake projects and teach best-practice project management principles. Users include Project Managers, Business Managers, Project Team Members, Lecturers, Students, Consultants, Trainers and Trainees. The following diagram describes how customers use MPMM to meet their goals. It's well known that a large percentage of projects fail to deliver the benefits expected by the business. In fact according to The Standish Group, more than 70% of projects fail to deliver on time, within budget and to specification. So why do so many projects fail to meet the customers' requirements? Poor sponsorship, lack of defined requirements, and miscommunication between the project team and stakeholders are some of the most common causes. Project Managers must attempt to manage change, risks and issues "on the fly". Increase the likelihood of achieving overall project success. How will I benefit from MPMM? Whether you're a manager, team member, consultant, trainer, lecturer or student, you will benefit greatly from adopting the Method123 Project Management Methodology (MPMM) for your projects. MPMM is suitable for projects of all sizes. 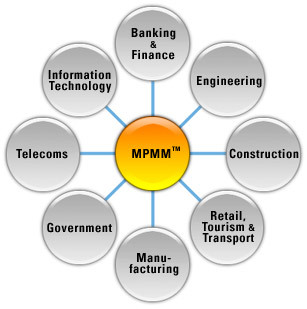 Whether your project has a budget of $1,000 or $100 million, MPMM provides a standardized approach to achieving success. To ensure that MPMM is directly suitable to your project environment, we have listed the most suitable activities for small, medium and large projects within a Project Sizing matrix. Regardless of your industry, MPMM will add value to your project by providing a powerful framework for delivering it quickly and efficiently. Why is it best practice? To ensure that the phases, activities and tasks defined in MPMM are best practice, we have aligned the content with the principles set out by the worldwide Project Management Institute (PMI®) as defined within "A Guide to the Project Management Body of Knowledge" (PMBOK® Guide). The PMBOK is the worldwide standard for best-practice Project Management. See www.pmi.org for more information. MPMM is also aligned with Prince2®, the European standard for project management. Click here if you would like to view a 'best practice comparison' between MPMM, the PMBOK® and Prince2®. "This project management methodology is very impressive. It includes a wealth of information describing how to manage projects, and it's really easy to navigate."